Gibson Dunn | Feller, Sean C.
Sean Feller is a partner in Gibson, Dunn & Crutcher’s Century City office. 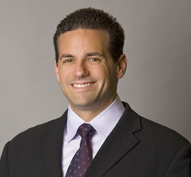 He is a member of the firm’s Executive Compensation and Employee Benefits Practice Group. His practice focuses on all aspects executive compensation and employee benefits. His practice encompasses tax, ERISA, accounting, corporate, and securities law aspects of equity and other incentive compensation plans; qualified and nonqualified retirement and deferred compensation plans and executive employment and severance arrangements. Mr. Feller has been recognized by his peers as one of The Best Lawyers in America in the area of Employee Benefits (ERISA) Law. BTI Consulting named Mr. Feller as a 2018 BTI Client Service Super All-Star, one of six “standout attorneys who received recognition from multiple influential General Counsel and legal decision makers.” In 2018, he was ranked by Chambers USA as a Leading Lawyer in California in the area of Employee Benefits and Executive Compensation. Mr. Feller received his law degree from Columbia Law School in 2000. He earned a Bachelor of Science from Cornell University in 1997. He is admitted to practice in the States of New York and California.